This tutorial provides you with a foundation for working with fixing images in Adobe Photoshop Elements. 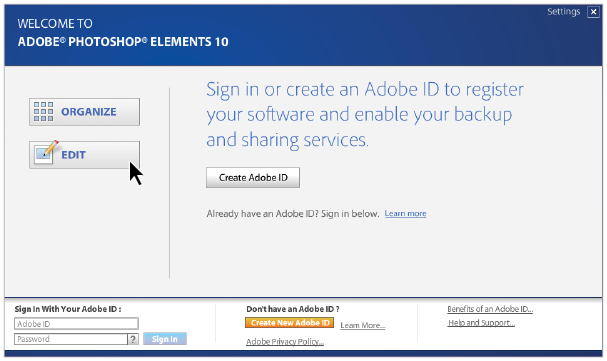 It is the third lesson in the Adobe Photoshop Elements 10 Digital Classroom book. In this lesson, you will explore how Photoshop Elements makes it easy for you to automatically correct and adjust most images in seconds. You’ll also explore more advanced tools that allow you to correct red eye, or the sky, in an image. Finally, you’ll discover how to rotate and crop an image. If you’re currently viewing the Welcome screen, press the Edit button ( ) to enter the Editor workspace. If you are currently in the Organizer, click the Fix tab in the upper-right corner of your screen and press the Edit Photos button or select an image and choose Edit > Edit with Photoshop Elements. Choose the Editor from the Photoshop Elements Welcome screen. In Photoshop Elements 10, adjustments to your photos are made in the Editor. If you want to crop, straighten, or color correct your images, the Editor is where this happens. It is the one-stop shop for all your photo correction and retouching needs. The default Editor interface is divided into five main areas: the Toolbox, the Options bar, the Project Bin, the Panel Bin, and the Menu Bar. The Toolbox on the left side of the workspace stores all the tools you need to select, cut, paint, and correct your photos and can be viewed in a single or double column view by clicking and dragging the toolbox using the double line ( ) at the top of the Toolbox to undock it. Then you can click on the double arrow ( ) at the top of the Toolbox to switch to double or single column view. When you are finished you can dock the Toolbox again by dragging it by the double line back to the side of the interface. The menu bar contains all the menus available in the Editor workspace, as well as other buttons that help you to work quickly in the Editor. The Options bar at the top of the workspace displays the options for the selected tool. The three tabs on the right side of the Options bar switch between the Edit, Create, and Share modes. Within the Edit tab is a drop-down that allows you to change between Full, Quick, and Guided Edit modes. The Project Bin displays the images that are currently open in the Editor. When you have multiple files open at once, the Project Bin provides a quick and efficient way to switch from one file to another. The Panel Bin on the right side of the workspace stores the Layers and Effects panels as well as any other active panels. Located at the bottom of the Editor, the Project Bin displays thumbnails of open photos. It’s useful for switching between multiple open photos in your workspace. Choose Window > Project Bin to toggle the display of the Project Bin on and off. The Panel Bin in the Editor lets you store multiple panels in a single area. The Panel Bin provides fast access to your panels. By default, the Panel Bin appears on the right side of the workspace. Choose Window > Panel Bin to toggle the Panel Bin on and off. The Toolbox contains every single tool that is available in the Editor. There are almost 50 tools available in the Toolbox for you to choose from. These areas of the workspace can’t be customized, but rather have a default appearance in the editor. 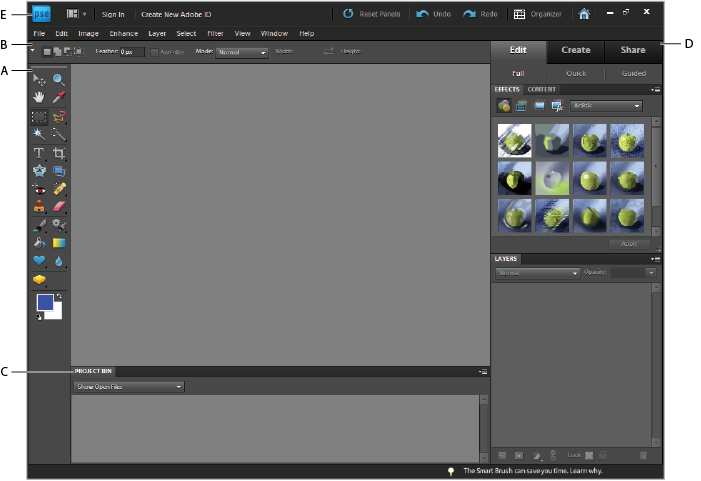 They are staples of the workspace and as you will find, get used frequently when editing images in Photoshop Elements. When the Edit tab is active, you’ll notice three buttons directly below the tab: Full, Quick, and Guided. You’ll take a look at all three of these modes during this lesson, as you explore how easy it is to fix common photo problems that can occur in your images. When the Edit tab is active, there are three buttons available. You can choose between the Full, Quick, or Guided editing modes.